Posted 2nd August 2017 & filed under Blog. Older people in the UK suffer from significantly worse health and wellbeing than in many other developed countries, according to the findings of the new Global Ageing Index, which has recently been published by Columbia University’s Mailman School of Public Health. 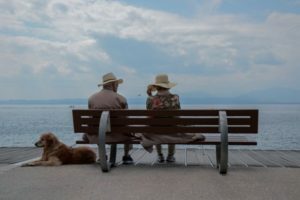 Its comparison of 30 different countries showed that the top five countries for the health and wellbeing of older people were Norway, Sweden, the USA, the Netherlands and Japan, whereas the UK came significantly below them. The Global Ageing Index was based on a comparison of how the different countries performed across five different domains of health and wellbeing in later life: “Productivity and Engagement” (which measured connectedness with the outside and particularly the workforce), “Well-being” (which measured general health), “Equity” (which measured how evenly distributed wellbeing and economic security were between people with different levels of wealth), “Cohesion” (which measured “across generations and social connectedness”), and “Security” (which measured support for retirement and physical safety). Each country’s scores against each of these domains were then weighted to produce an overall score for each country. The UK ended up with a score of 51.9 in the overall index – behind the USA, Japan and most European countries – whereas Norway (the highest scoring country) got 65, and the lowest-scoring country, Hungary, had 23.5. However, the UK did have the second-highest score for the “Cohesion” content area, coming second to Ireland. Interestingly, different countries tended to vary quite a lot in relation to how they did against the different content areas: Norway was the best country overall largely on the basis of its extremely high performance against the “Equity” content area (which makes sense given that Scandinavian societies are globally recognised for their high degree of social equality), whereas the USA did very well for “Productivity and Engagement” (which may be explained by the country’s high labour force participation among older workers) but much worse for “Equity” (because the USA is one of the world’s most unequal societies). Surprisingly, it doesn’t appear that the Mailman School has actually published the individual metrics that made up each content area in any of the publications they have launched so far to publicise the Index. This is a major limitation when it comes to assessing the potential viability of the overall Index, because without them we have no way of knowing what the researchers were actually measuring to arrive at the overall scores they awarded to each country. It is especially difficult to work out how the UK came to score so highly for “Cohesion” as it isn’t obvious what exactly the researchers could have used to measure the degree of social interaction or societal cohesion between different age groups; IF’s previous research in this area has suggested that people who belong to different generations have been having less social contact with each other because of rising age segregation over recent years, which doesn’t chime with these findings.